I'm making my way through the films again now, and here is the first of my rambling write-ups. Be warned: I have mostly positive things to say about Sorcerer's Stone and indeed all of the films. I feel like one of the few who greatly appreciate them all as films and as adaptations. He’s not a complete cipher behind the camera, but Chris Columbus has never been a director with that much personality or style. With Harry Potter and The Sorcerer’s Stone (or Philosopher’s Stone, depending on your location and preference), he basically gets out of the way and does everything he can to keep J.K. Rowling the storytelling voice. And I actually think that’s exactly what this first installment in the series needed. I don’t think this movie is too faithful to the novel, I think Columbus was right to be as faithful as he was here. Sorcerer’s Stone doesn’t pose nearly as much of a challenge as the succeeding books in the series, it doesn't need as much work to turn it into great cinema. His direction may not be as distinctive as the directors who would follow him, but he laid the right foundation, and made an exceptional film. I haven't read any of Steve Kloves' Harry Potter scripts, so I can only look at what's onscreen to evaluate his writing. That's not entirely fair, but so be it. On the surface, Steve Kloves was an odd choice for this project. He'd written and directed The Fabulous Baker Boys and Flesh and Bone, he'd written the film adaptation of Michael Chabon's Wonder Boys, but those were intimate character dramas. They were very good intimate character dramas, but still, he wouldn't be the first screenwriter to come to mind. He was also a smart choice, though, having brought several vivid, multi-dimensional characters to life in those films, as well as shown a knack for joining his voice with that of an author whose work he was adapting. There’s not a great deal of adaptation going on with Sorcerer's Stone, but as with Columbus, Kloves knew when to get out of the way and how to properly maintain Jo Rowling's voice. There aren't a lot of changes needed. The ones that were made - Harry and Draco meeting in Hogwarts instead of in Madame Malkin's, the trio stumbling upon Fluffy after being whisked off by a moving staircase as opposed to the midnight duel situation, condensing the scenes with Norbert(a) - were insignificant ones, but they were smart choices. Steve Kloves deserves more credit for what he did here than he receives. He's presenting someone else's world, and very faithfully, so the credit shouldn't exactly be for world-building, but he built a fine foundation just as Columbus did. He captured the tone, the spirit, and the characters in the first book beautifully, and wrote a exceptionally charming, entertaining, enchanting film. The credit for the story he's working with goes to Rowling, but the credit for how well it's told here goes to Kloves. I have a lot more respect for what Chris Columbus did in this movie since watching the first installment of the “Creating the World of Harry Potter” documentary; as much as Daniel Radcliffe, Rupert Grint, and Emma Watson started off with some genuine, natural talent, he pretty much wrangled these performances out of them. And they’re good performances! Now, of course, you’re supposed to come out of that documentary thinking that way, but I thought highly of the kids’ performances and Columbus’ direction before – and moreso these days. Radcliffe, Grint, and Watson are terrific – with Watson the standout by far – giving energetic, charming, wonderfully-timed starring turns. Radcliffe’s a bit blank at times, but it’s not uncommon for the hero in a movie like this to be among the least interesting or dynamic characters in it. Harry’s not completely passive, but because this is the most reactive he’ll be throughout the series, it’s also the least interesting he’ll be throughout the series. Radcliffe’s performance is successful in this case not only because he is empathetic, he is likeable, he does consistently convey the wonder that we should be experiencing through him (‘though he could do a bit better there – he’s good, but it’s more apparent than with Grint or Watson that he’s working, and so he’s not as successful), but there’s a soulfulness to him, just innately. Columbus has talked in interviews about being struck right away by his eyes, by how melancholy they looked, and it’s true, and it’s great, I love that Harry has that sort of aura of sadness about him already – but it’s not too much. Besides his comic flair, which is bang-on right away, Rupert Grint has a lovable quality and a kind of old-fashioned presence that’s almost like he’s stepped out of an Our Gang short from 1938 or something. He’s completely charming – as is Emma Watson (and the pair of them, a chemistry that we’ll see grow brilliantly over the years). She’s perfectly pitched, it’s a really confident performance. This is what you want to see from an inexperienced child actor; it’s not that she seems practiced, it’s that the lack of experience has fantastic results. Rupert is almost as good as Emma, Dan’s a little further behind but still very good, and the three as a unit are great. Nearly every supporting character in the series starts off as a type – an excellent example of the type, but a type – with new shading/complexity added as the story proceeds. In a coming-of-age story of this scale, that should be the way it goes; our perspective on the people around us changes and deepens over time. No character provides a better example than Dumbledore. For now, Dumbledore is the impossibly wise master wizard, the grand mentor, who was surely never young, inexperienced, or inexperienced, or unsure (right?). Of course, these are the latest days of Harris’ career, so he looks like he’s lived and has wisdom to spare. He has such an easy warmth and charm about him as well; I couldn’t be happier with the Richard Harris Dumbledore. You just know that Tim Roth is kicking himself to this day for turning this role down, especially as he turned it down because it conflicted with his commitment on Tim Burton’s Planet of the Apes. Roth is a fine actor (he was my wish-list choice for Fenrir Greyback, back when I thought Greyback would be an actual character), but this was one of the best things to happen to the series. Few actors have a screen presence that comes anywhere close to that of Alan Rickman. He practically flies through the door of that Potions classroom in his first real scene, and he has a tight hold on the audience from that moment on; he’s totally magnetic. That first scene in particular is one of his best in the series, and his most theatrical. As Rowling has told it, she had Robbie Coltrane in mind for Hagrid and suggested him for it right away. How could anyone argue with the casting? He’s the only choice. He moves and carries himself wonderfully – gruff/imposing on first appearance, but friendly and compassionate in truth. This is such a fairy tale figure, the (half-)giant who we first see to place Harry with his aunt and uncle until the time is ready for him to return and whisk the boy away and take him to his new life and on a great adventure. Hagrid is the first character to exemplify the key theme that nothing and no one is as it/they seem. When we meet McGonagall, she’s that stern, intimidating teacher who’s not mean, but…you wouldn’t want to be on her bad side. That remains, but we do see a warmer side to McGonagall as well, and we get that by way of quidditch (I’ve always liked that she’s an unabashed fan, beyond just a head-of-house naturally rooting for their team). Maggie Smith is always a pleasure to watch, and fits like a glove as McGonagall: witty, graceful, strong, admirable. Oh, how perfectly loathsome these Dursleys are. Griffiths and Shaw have a lot of fun as the classically cruel, oppressive “guardians” to Harry before his real, better life comes calling, and Melling’s Dudley is as detestably spoiled as Harry is sympathetic. It’s satisfying to look back at the scene where Petunia breaks her silence about Lily (“And then, if you please, she went and got herself blown up”) and see not simple contempt, but a resentment that’s been lurking in her for decades. Her sister was special, and in a way that she couldn’t learn to be herself, and she’s turned that ‘rejection’ into a desperation to be looked upon as normal. Draco is another character who’ll develop in a really compelling way...It just takes awhile (and the threat of his family’s ruin and/or death). At this point, Felton’s terrific as the snobbish, preening little “pureblood” – it’ll make much more sense when we meet his father in the next go-round. It can’t be all about Voldemort all the time, Harry needs an opponent at school, and Malfoy’s a fine one. Felton has great comic timing, too, which he’ll get to demonstrate a little more in Chamber of Secrets (“I didn’t know you could read”). It’s kind of a shame that Draco’s role is so minimized after that; he barely registers again until Half-Blood Prince. I’ll just say about Ian Hart, he was definitely convincing enough as the cartoonishly skittish façade that it is a genuine surprise when Harry discovers that he is the villain of this story – and a greater surprise when he takes off that turban. (It’s a very troubling notion, having Voldemort attached to the back of your head.) I say this as someone who saw this movie before reading the books. John Williams is my favorite composer not just because he’s had the gift of creating a melody that’s striking and that stays in one’s memory forever, but because he’s brilliant at crafting such a melody that’s also a perfect encapsulation of what a particular character or series is about. His Superman theme, his Indiana Jones theme, his Darth Vader theme (or what came to be his Darth Vader theme) are as identified with those respective characters and worlds as any image. Same with “Hedwig’s Theme.” Sorcerer’s Stone has taken some flak for being overscored, and perhaps it is, but it doesn’t bother me. Williams’ best work for the franchise is yet to come, but this is a marvelous introduction, fine musical world-building. "Leaving Hogwarts," I think, is my personal favorite, a lovely piece of music. The art direction/production design has been the most successful element of the films, consistently and undoubtedly. Stuart Craig and his art directors and set decorator created a truly immersive, really impressively detailed world that goes far beyond the limits of what the camera can show you. There were time and budgetary constraints on this first film, and Craig's on record as being disappointed with how Hogwarts initially looked - its lack of an iconic silhouette, for instance - but still, flaws and all, I can't help but be totally impressed in this area. My favorite set in Sorcerer's Stone has to be the giant chessboard; it's just...well, so damn cool. The cinematographers the series has had don't get the credit that, say, Stuart Craig does, and that's understandable; it's easier to recognize and therefore praise (or not) a great set than it is great cinematography. But John Seale lends Sorcerer's Stone just the right warm, enticing look. Enjoy it while it lasts. -It's been ten years, so one shouldn't expect the visual effects to hold up exactly - and they don't. There's quite a bit of wonky CGI now, but it doesn't distract me in a negative way. I find it kind of charming, actually. -I appreciate that the time was taken in Deathly Hallows: Part 1 to have Harry take one last look inside the cupboard under the stairs. It would have been very easy to not do that. -"There's where you get your bits and bobs for doing your wizardry." Really? It seems like someone just couldn't think of something more specific to put there, but it's funny. -The scene in Ollivander's wand shop is the best in the movie. It really feels like we're starting something grand there. -"After all, You-Know-Who did great things. Terrible, yes...but great." That's such an intriguing aspect of Ollivander's character, books and films, that he may be admit how horrible Voldemort is, but he still has this admiration for him or what he's achieved. -"She knows more about you than you do!" "Who doesn't?" Great line, and it will only become more relevant. -Quidditch scenes will never be among my favorites, not in the books nor the films, but sort of by its very nature, it's more interesting to watch than to read about. There's nothing wrong with any of the quidditch scenes, I just don't find any of them particularly compelling. This one is obviously the most exciting because it's the first. -"I like this ball." Harry, you're eleven. Come on. -It's not a big deal that it's not here, but my favorite line in the book is actually quite important to the series as a whole: "To the well-organized mind, death is but the next great adventure." It'd be nice if it was placed during DH2 (certainly there are a couple of opportunities), but I'm not counting on it. -For the only time, the students wear hats, at the end-of-year feast. They were wise not to stick with that; it's not a great look. -"Leaving Hogwarts" is a really lovely piece of music. In his absolutely glowing (four-star) review, Roger Ebert hailed Harry Potter and The Sorcerer’s Stone as a fantasy film on the level of The Wizard of Oz. I was surprised that he enjoyed it that much at the time, but Ebert was my #1 go-to film critic then (and I still read his writing regularly), so I was glad to hear it. I wonder if he would be as enthusiastic now, but for me, it’s not too hyperbolic to compare this movie to the best film fantasies. It’s not there on the level of The Wizard of Oz or Star Wars, but it deserves mention in the same company. 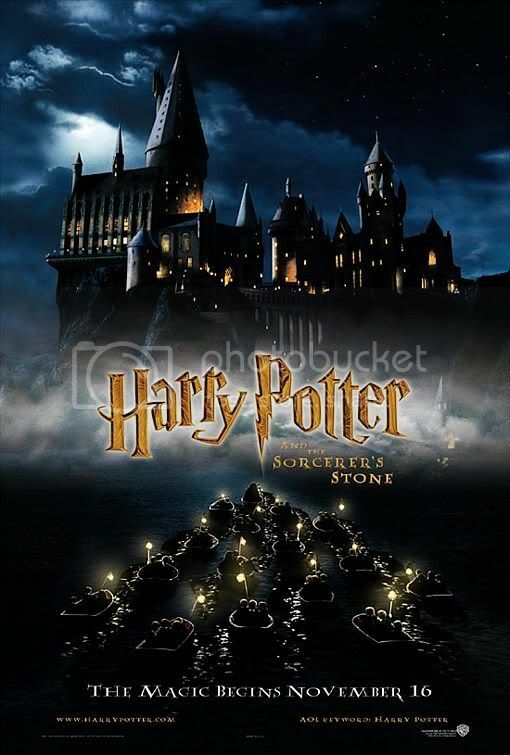 Obviously it’s setting the stage for much bigger, richer things to come, but if this weren’t the first of a seven/eight-movie series, Sorcerer’s Stone could theoretically stand alone as a…well, a classic. It works its magic that well. Last edited by IenjoyAcidPops; May 28th, 2012 at 8:54 am.